Polour Camp is the best starting point for the south and the west route of Damavand Mountain Iran. Mt Damavand ski and snowboard tour. Downhill ski touring on mild slopes of Damawand Iran. Hiking & trekking and climbing tours. The south route of Damavand Iran is the most comfortable and favorite face for climbing, skiing and snowboarding, read some info about the camps located on this side. Download the full size image in jpg format. Polour Camp is the best starting point for the south and the west route of Mt Damavand. If you travel from Tehran, Polour is a shortcut to the mountain. It is a new established resort made by Mountain Climbing and ski Federation of Iran. Note: Reyneh Camp is not recommended any more! Tehran > Haraz Road > Reineh > Reineh Camp (approx 3 Hours). Also called Goosfand Sara Shelter or Mosque. In winter you can not go you to Damavand BaseCamp by car, because the gravel road is covered by snow and ice, so you have to start your climb from the gravel road junction. 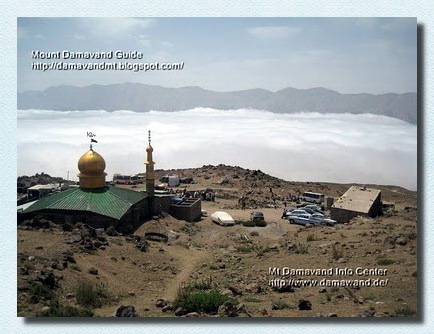 Visit also Damavand Warning. Begining of gravel road to basecamp, in winter you should start climbing from this point. The gravel road to basecamp is covered by snow and ice and it is imposible to use car. If you travel either from Tehran or north of Iran, you will come to this junction anyway. In winter By 6 to 8 hours climb you reach the Bargah-e Sevom New Hut, you may carry heavy equipments yourself or use porters. No foot paths are visible, it is not easy to find them, if you start in the morning you have enough time to reach the camp in time, use the day light only, never start in the darkness. 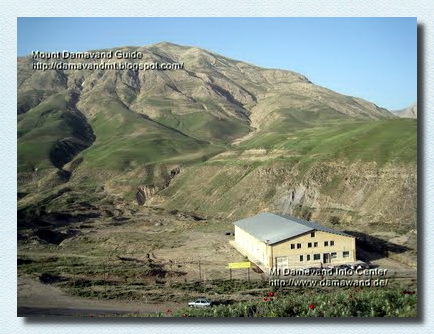 Visit also Damavand Weather Forecast. Damavand Süd-Route Campingplätze. Damawand Berg Camps. Mt Demavand Ski- und Snowboard Tour. Downhill Skitouren auf milden Hängen Demawand. Iran Trekking- und Klettertouren Expedition. Teheran Ski geführte Abenteuer-Touren. Downhill Ski-Expedition Persien. Skitouren und Snowboardtouren zu Alborz Mountains. Iran Skitourenreisetour . Iran Wintersportreisen. Iranski Urlaub Reisetour . Skitouren Teheran. Iran geführte Skitour. Iran den Tiefschnee Aktivität Tour. Iran Snowboardtouren. Mount Damavand south route campsites. Damawand mountain Camps. Mt Demavand ski and snowboard tour. Downhill ski touring on mild slopes of Demawand. Iran trekking and climbing expedition tours. Tehran ski guided adventure tours. Downhill ski expedition Persia. Skitouring and snowboard tours to Alborz Mountains. Iran ski mountaineering travel tour. Iran winter sport tours. Iranski vacation travel tour. Ski mountaineering Tehran. Iran guided ski tour. Iran off-piste ski activity tour. Iran snowboard tours. 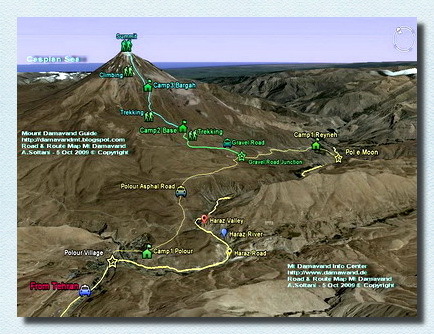 Monte Damavand campings ruta sur. Damawand montaña Campamentos. Mt Demavand esquí y el snowboard gira. Cuesta abajo esquí de montaña en las pendientes suaves de Demawand. Irán trekking y escalada excursiones expedición. Teherán esquí guiado tours de aventura. Downhill expedición de esquí Persia. Skirando y snowboard excursiones a las montañas de Alborz. Viaje del recorrido de esquí de montaña Irán. Irán giras de deportes de invierno. Viaje del recorrido vacaciones Iranski. Esquí de Montaña Teherán. Irán visita guiada de esquí. Irán fuera de pista gira la actividad de esquí. Irán giras snowboard. Mont Damavand itinéraire sud campings. Damawand montagne Camps. Mt Demavand ski et de snowboard tournée. Descente ski de randonnée sur les pentes douces de Demawand. Iran randonnée et d'escalade de l'expédition. Téhéran ski visites guidées d'aventure. Ski alpin expédition Perse. Skirando et de snowboard visites à Alborz Mountains. Visite Voyage de ski alpinisme en Iran. Iran visites de sports d'hiver. Visite Iranski de Voyage de vacances. Ski Alpinisme Téhéran. Iran visite guidée ski. Iran hors-piste tournée d'activité de ski. Iran visites de snowboard. Mount Damavand rotta sud campeggi. Damawand montagna Camps. Mt Demavand sci e snowboard tour. Sci alpinismo discesa sui pendii lievi di Demawand. Iran il trekking e arrampicate spedizione. Teheran ski guidato tour. Ski spedizione Downhill Persia. Sci-alpinismo e snowboard escursioni a Alborz Mountains. Iran viaggio tour di sci alpinismo. Iran tour sport invernali. Iranski giro viaggiare in vacanza. SCI ALPINISMO Teheran. Iran visita guidata di sci. Iran giro fuori pista l'attività di sci. Iran tour di snowboard. Mount Damavand sør rutecampingplasser. Damawand fjell Camps. Mt Demavand ski og snowboard tur. Downhill skiturer på milde bakken av Demawand. Iran trekking og klatring ekspedisjonsturer. Teheran ski guidede opplevelsesturer. Downhill ski ekspedisjon Persia. Skitouring og snowboard turer til Alborz-fjellene. Iran ski fjellklatring reise tur. Iran vinter sport turer. Iranski ferie reise tur. Ski fjellklatring Teheran. Iran guidet skitur. Iran off-piste ski aktivitet tour. Iran snowboard turer. Демавенд юго маршрут кемпинги. Damawand горные лагеря. Mt Demavand лыж и сноубордов тур. Горные лыжи гастроли на мягких склонах Demawand. Иран походов и восхождение экспедиции туры. Тегеран лыжный руководствоваться приключенческие туры. Горные лыжи экспедиция Персия. Skitouring и сноубордов туры в Эльбрус горы. Иран горнолыжный туристических путёвок. Иран Зимние виды туров. Iranski тур отдых путешествия. Альпинизм в Тегеране. Иран руководствуется лыжный тур. Иран внетрассового катания горнолыжный активность тур. Иран сноуборд туры. Demavend yugo marshrut kempingi. Damawand gornyye lagerya. Mt Demavand lyzh i snoubordov tur . Gornyye lyzhi gastroli na myagkikh sklonakh Demawand . Iran pokhodov i voskhozhdeniye ekspeditsii tury . Tegeran lyzhnyy rukovodstvovat'sya priklyuchencheskiye tury . Gornyye lyzhi ekspeditsiya Persiya . Skitouring i snoubordov tury v El'brus gory. Iran gornolyzhnyy turisticheskikh putovok . Iran Zimniye vidy turov. Iranski tur otdykh puteshestviya . Al'pinizm v Tegerane. Iran rukovodstvuyetsya lyzhnyy tur. Iran vnetrassovogo kataniya gornolyzhnyy aktivnost' tur . Iran snoubord tury.